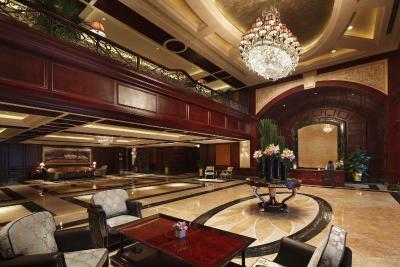 Lock in a great price for InterContinental Shanghai Ruijin – rated 8.8 by recent guests! The breakfast and room service was great. The staff was very attentive and they gave us a special treat as it was our anniversary. The bed was very comfortable and the room was quiet indeed. The gardens in the property are beautiful - too bad it was too cold to go walk around them! Location is very good. Setting and atmosphere are great. Beautiful garden throughout very peaceful place to be after a long day around the city. - Bed is comfortable. - Room is spacious, well decorated. - Decent breakfast selection. The warm atmosphere at the club dining room and the great location. We very much enjoyed our weekend here. 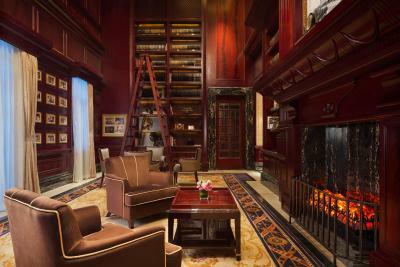 It was luxurious - roll-top bath, very nice breakfast, lovely library to sit in. It was what we were looking for. We could walk to Tianzinfang area easily for dinner, and it wasn't too far to the subway (3 blocks). Staff were friendly especially in driving us in the golf cart from one building to another. We were upgraded to a Club room, so we got a welcome drink. It was a great weekend for us. 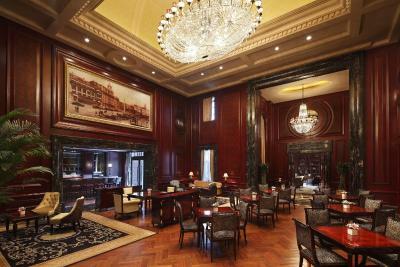 Great historic hotel in an excellent location in Shanghai. It's walking distance to the Shaanxi Road South metro station with easy access around the city and to the high-speed trains at Hongqiao Railway Station via Line 10. It is an oasis within a large, bustling city. The grounds are extensive and the well manicured garden is a true delight. Sounds of crickets and birds drown out the usual city noises. The Club rooms are big and luxurious. Great service. Prime location (near Central Huaihai Road) with quiet and pleasant surroundings. An 'oasis with history' amidst the hustle and bustle of the city. Excellent concierge. One of our top picks in Shanghai.Spreading over 100 acres of landscaped gardens, InterContinental Shanghai Ruijin features its lovely art decor, French provincial-style villas and 4 historical buildings including Morris Residence, which was built in 1917. Hotel is surrounded by a range of dining, shopping and entertainment options. Cultural Center, Huaihai Road and Tian Zi Fang are all within close walking distance. Located in the former French Concession, it is only a 5-minute stroll from local attractions like Huaihai Road and Shanghai Culture Square. Shaanxi South Road Metro Station(Line 1, 10 &12) is a 15 minutes' walk away. Hongqiao International Airport is 50 minutes' metro trip away. All luxurious guestrooms combine the glamor of Old Shanghai updated with a fresh, contemporary design. Some rooms have garden views from its romantic balcony. Free Wi-Fi is offered throughout the hotel. The hotel has a tour desk that assists with currency exchanges and sightseeing arrangements. It also has a business center and concierge desk. Guests can request for babysitting services. Xin Yuan Lou Restaurant serves an extensive selection of Chinese cuisines, while La Rue all-day dining restaurant serves global fusion food to all food lovers. 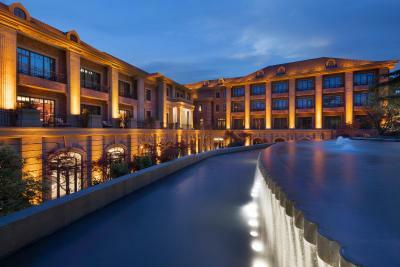 When would you like to stay at InterContinental Shanghai Ruijin? Room comes with free bottled water, mini-bar and ironing facilities. The private bathroom features double basins and a separate shower. Guests are entitled to enjoy exclusive club lounge access with breakfast and evening cocktails. Offering a separate living lounge, suite comes with a walk-in closet and a large bathroom with branded toiletries and a bathtub. Guests can enjoy the exclusive club lounge access. Room comes with a 42-inch LCD TV, a writing desk with an ergonomic chair and an private bathroom with a separate shower and a bathtub. This room offers ergonomic desk and a 46-inch LCD TV. The large bathroom comes with branded toiletries shower. nterContinental Shanghai Ruijin, formerly the State Guest House of Shanghai, has a rich heritage having served Chinese historical figures such as Chairman Mao Zedong and Premier Zhou Enlai. 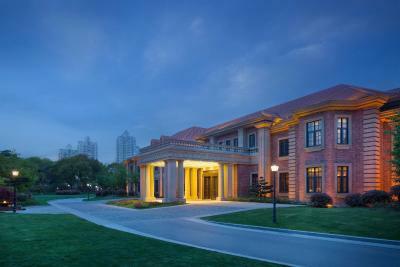 During the War of Liberation, the hotel was the headquarters of the Communist Party in Shanghai. The classically styled hotel is centrally located along tranquil Ruijin Er Road, close to Huaihai Road’s luxury retail, the quaint shops at Tianzifang, and the trendsetting Xintiandi bars and restaurants. House Rules InterContinental Shanghai Ruijin takes special requests – add in the next step! Greatwall Peony Dragon Jin InterContinental Shanghai Ruijin accepts these cards and reserves the right to temporarily hold an amount prior to arrival. InterContinental Shanghai Ruijin accepts these cards and reserves the right to temporarily hold an amount prior to arrival. Guests are required to present the same credit card used to guarantee your booking (both names must be the same) for checking in and making the payment. The staff was wonderfully helpful. The staff hardly speak any English even when asking for basic things like rest room and directions. Beautiful room and the hotel area very nice. just few people can speak English. Except it, nothing got me annoyed. All staff are so kind and nice. They upgraded my room, that's very nice. Hotel is so classic and gorgeous. I did experience historical building in Shanghai. Convenience store is so close and it's easy to buy what you need. Room, upgraded one, is so excellent and clean. The rooms was very spacious, our grandson (currently a student in Shanghai), stayed with us in the room on an extra bed which was not a problem for the size of the room at all. The staff arranged this very speedily. The extra bed was less comfortable and rather small. We asked for extra pillows, which were eventually provided to us. The staff was friendly, and courteous. It was difficult for the taxi driver (from the airport) to find the hotel entrance at night, luckily our Chinese speaking grandson was able to assist with this. A good experience. Poor wifi connection . Way too hot in the fitness area. The room in the Presidential aisle was awesome . Very nice place in a beautiful and peaceful garden. Perfect location in Shangaï . Coffee service of breakfast was slow. It could improving. The bed was very comfitable. Front Desk and Bell boys are very frinedly and efficient. Equipments: some were old and broken. We accidentally didn't go to the main lobby for check-in, but rather the club house, and the staff at the club house could have directed us to go there, as they couldn't pull up the details of my reservation while I was booking. Also the fact that they don't take UnionPay cards for deposits was a little inconvenient. Location, staff and general look and feel.